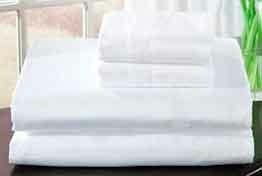 Elegantly tailored sheets, duvets, shams and bed skirts in 400 thread count Egyptian cotton sateen. Crisp white with large hemstitch trim framed with black fabric accent. Made in Portugal. A distinctive 100% cotton windowpane cutwork trim adds simple sophistication to our white sheeting. This clean and simple stylish hem trim accents the flat sheet, pillow cases, and shams offerting optimal versatility to suit any bedroom décor. Available in sheeting, pillow cases and shams. 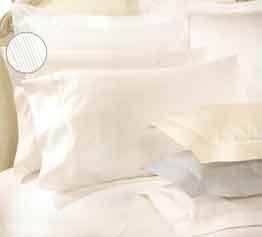 Coordinates beautifully with all of our duvet covers and coverlets. Color: White Made in Portugal. Simple, yet elegant, bedding enhanced with three rows of crisp, classic hemstitch on flat sheet, pillow cases and pillows shams. 100% Egyptian cotton sateen. Available in sheeting, pillowcases and shams. Coordinates with all of our duvet covers and coverlets. Color: White Made in Portugal. Simple refined elegance. This sheeting is from silky-smooth Egyptian cotton sateen and finished with a tailored pintuck hem design on duvet flange, flat sheet, pillows slips and sham flange, offering sophisticated clean lines and a timeless design. 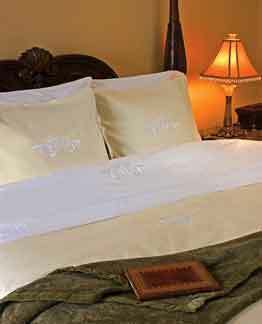 100% long staple Egyptian cotton solid color sateen. 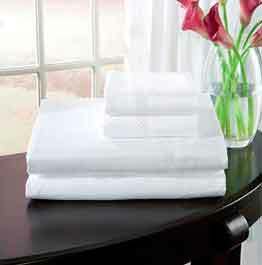 Available in sheeting, pillow slips, duvet covers, and shams. Colors: Blue, Ivory, or White. 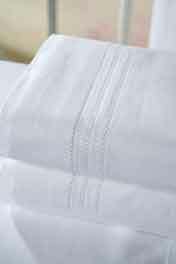 An elegant 100% cotton diamond cutwork trim adds luxurious detail to our white sheeting. 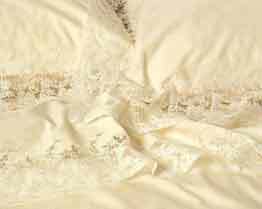 This exquisite hem trim accents the flat sheet, pillowcases and shams. Coordinates with any bedroom décor. 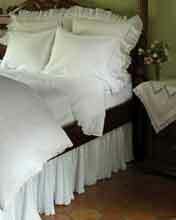 100% Egyptian Cotton Sateen in sheeting, pillowcases, and shams. Coordinates with all of our duvet covers and coverlets. Color: White Made in Portugal. Classic sophisticated styling. 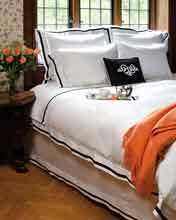 The white 400 single thread count 100% Egyptian cotton sateen flat sheet has a large heavy stitched monogram design. The coordinating ottoman cloth duvet cover is a cotton heavy twill weave in a warm cream color with a raised large monogram in white thread. The duvet has matching shams with white piped edging. Made in Portugal.